Posted in comment section by Al Berrin but worth posting here as well. My experience has been both in the Central Coast section and in Southern Section. Much of what happens at the State meet is dictated by the Southern Section. When I moved to the Southern Section, I was appalled by how much each section does to hurt their chances of doing well at the State meet. Each section sets their own criteria for who qualifies to the State meet. The Southern Section has a huge number of division I schools but because there are so many schools (600 schools)in the Southern Section, they have the advantage being able to field strong teams in all divisions. Other sections don't have that luxury. Some sections have very few true Division I schools in their section, but could be strong in division 2, 3,4, or 5. But since each section sets the rules for what is truly important to them, some have chosen to "sacrifice" a chance to do well at the State Meet to look better by "equalizing" their divisions at the section level. Since my experience was in the Central Coast, let me speak to what they have done to minimize their chances for success at the State level. They have chosen to equalize the number of schools in each division. Since there are only 3 schools that a true Division I schools in the section, they move 18 schools which are truly Division II schools into Division I. Then they move true Division III schools into Division II to equalize that division and schools that should be Division IV schools are moved to Division III. When I moved to Southern California, I coached at a school that was listed as a Division III school. The school I left in Central Coast was also a Division III school and yet the Southern California school was 500-700 students larger than my Central Coast school, so they already had an advantage. The Central Coast Section then compounded the problem by moving my former school to Division II where there might be a 1000 student advantage for the Southern Section teams. Having each section be autonomous in setting Divisions makes no sense and as long as that doesn't change, we are doomed to struggle with trying to make things more equitable every year. I am all for it. The track & field meet is the best high school meet in the nation because there are no divisions. There is only one fastest team and they should all race one another. A good change right now would be to add an indivual race, thus allowing additional teams in divisional races. No individuals in divisional races would allow additional teams. Why should individuals race in a particular division? Let them have their own race. Wait so, is there a possibility of there being a sweepstakes race added this year? One gun, one race, one state champ! A sweepstakes race will not change the huge numbers differences between the sections. All it will really do is help NXN pick the teams from California. The best solution I have heard is once the teams qualify out of their sections you put all the teams together and then divide them equally into state divisions.Top 27 teams to Division 1 and so forth. Teams could opt out from running in their division race and run in the sweep stakes race if they wanted to. Because of the Central Section's "competitive equality" system McFarland (860 students) HAS to compete in Division 1? Why not allow a school to move up to whatever Division they choose and leave everything else as it is. Very good article in Milesplit. I don't think there will any movement on a sweepstakes race, or a championship race until they move the cross-country state meet back a weekend. Moving it back would free up NXN to have a Cali regional. I don't see other states complaining about multiple divisional champs. It is also not typically the end of their season. They have NXN which they can qualify their entire team against teams from other divisions and states, where they can fairly determine the NXN qualifiers. Most Cali sections get two weeks of rest before the state meet, where they can slide in another week of competition. It is only the Southern Section who has so many teams, which need to run another weekend of preliminaries. If they can do it for football and basketball then it should be easy for cross country as CIF only needs to add two more races on the day of the state meet. After sections, a committee selects the top 20--25 teams in the state with teams given the ability to opt out and stay within their division (same as football and basketball?) The open division race can be held mid morning and only participating teams have a chance at qualifying for NXN. 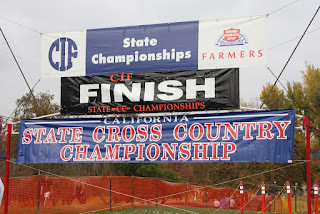 This approach helps CIF select a "true" state champion and is a lot easier than moving the whole schedule back a week just to accommodate Nike and NXN. Also to the commenter asking for an individual race as well, why? XC is a team sport and you don't see this at the highest levels, such as NCAAs and World Championships. If the "issues" are #1 deciding who are the top 2 teams for nxn, & #2 crowning an overall state championship team/individual, then a relatively simple solution might be to allow individuals and teams to, on their own accord, race up in a sweepstakes division. Similar setup to what the Clovis invite runs. You still have divisions and divisional champs, but you also have the "big race". Most of the top teams that think they have a legitimate shot at qualifying to nxn would race up, as would the top individuals. Everything else stays the same and everyone is happy. As one of the cons of this idea states in that article, what happens if a team in one of the divisional races that does not race in the sweepstakes races better than one or both of the top 2 teams that do qualify to NXN out of the sweeps race? I think most of us would say, "Too bad. It was your choice to stay down." And I would agree with that sentiment. But it does raise an interesting point. Also, maybe you can help me with this Albert, why doesn't the cif take over when establishing population caps for divisions? I mean I know it's like the federal and state laws type of thing, but do we know why the cif doesn't want to be in charge here? If the state standardized division caps then we wouldn't have the section to section numbers discrepancies, and in theory it would be more fair. In this scenario it would also take away the central section's "competitive balance" (er McFarland wins too much) rule. "why doesn't the cif take over when establishing population caps for divisions?" When the state meet began in 1987, the divisional cut-offs were statewide. The problem became apparent after a few years in that the distribution of school sizes were not the same in each section. For example, there would be years when Chico was the ONLY Division 1 school in the Northern section. Does that mean that they would automatically make the state meet every year? Similarly, if strict statewide divisions were enacted, then the CCS might have only 5 schools in D1, but 50 in D3. Is that fair at the section level? Let individual sections determine their own school groupings for local section championship purposes and for purposes of determining who goes to state from that section, and then reseed all schools at the state meet based on a standard set of criteria. What would those standards look like? 1. CA has the latest State XC Meet in the Nation. This has been a problem in USATF and AAU XC competitions for years. However, CIF has stood firm that they make the most money on the weekend after Thanksgiving, and we know that where there is money, the one controlling the money controls the power. Thus, CIF would have to change the date of the State meet...and they have fought USATF and AAU for years as it is always about the money! 2. Divisional groupings should be based on a statewide set number of enrollment. If you only have one D5 school or 300 D1 schools in your section, so be it. The race is not based on the number of people in it, it is based on the fastest individuals and teams (Note let's get the semantics straight: XC is an individual sport scored as a team...it is not a team sport). 3. Who gives a flying-fig about what Nike wants to do or not do in Oregon? Nike is not the end-all-be-all of running and has done as much to hurt the sport as to help the sport. Nike does not care about the athlete, they care about the future sales from indoctrinated kids and their families, not on individuals unless you already have a contract with them...then they care.. Nike is a corporation that has a sole purpose to make a profit. 4. Back the State XC Meet up one weekend. Race it within standard divisions. Set a "team-time" standard and those that make that "team-time standard" (Possibly the 10th or 12th fastest team time from the previous year) and those teams that make the time get to compete the following weekend in a "Sweepstakes Race". Add to this grouping, the top 50 individuals, by time, not on a qualified team, to run as individuals in the race. This provides for one "qualifying" race with the basis being times...what it should always be about. How the various Sections then qualify their representative teams and individuals for the State meet should then be left up to the Section on how to qualify their misrepresented or over-represented divisions. Just some thoughts on the subject. It can be done...but, should not be done for the sake of increasing Nike Profits! 9:07 asks "What would those standards look like?" It could be as simple as putting all of the teams at the state finals into a list based on enrollment (large to small), and the top 20% based on enrollment size would compete in the D1 championship, the next 20% in D2 and so forth down to D5 for the 20% of schools at the meet with the smallest enrollment. I'm not strongly in favor of a sweepstakes race, mostly because I'm opposed to the endlessly upward spiraling "Who's the Best?" mentality, especially when fixated on teenagers. Only a very few (five? maybe six?) teams would legitimately compete for a sweepstakes championship, and only a few dozen spectators really feel cheated by not having one. I say let them wonder and have their debates, and the rest of us will be grateful for the state meet experience we've had and then move on with our lives. That said, were a sweepstakes race happen I think the right way to do it would be to make it by-invite and optional. I like the "re-seeding" idea between section and state too. I dunno, if it were up to me, I'd move the state meet a week later, just to screw with Nike even more. I like the idea of an Individual Sweepstakes race at the state meet. That solves a lot of problems. I agree that the Nike Nationals are no reason to rearrange the California State Meet. Having better weather allows us to train further into the season towards our State championships. Other states, with other rules, have rules that allow a single team to train entirely for the Nike nationals with a month or more between their state meet and the Nike qualifying. And I don't think there are two or three states with the same level of competition at state meet at any level, so they can slide through and train for another peak a month later. Therefore, the California State Meet is the top level of competitive effort for our teams, and the Nike thing is perhaps an extra bonus but not the rationale for the season focus. But the question of a sweepstakes race -- my suggestion is to have the sweepstakes race, which is self selected, but the teams involved have to understand that they risk not being podium teams in the regular divisions regardless of team times. Also, they risk being bounced from Nike consideration despite the Sweepstakes appellation, since Nike has no reason to regard any criteria other than their own. What's two more races in a day? Schedule the Sweepstakes the last races of the day, so it doesn't disrupt the regular divisions' scheduling. What is the net result of all this? Teams that think that they are in the running for top dog honors get to self-select at the State Meet. The rest vie for divisional honors. There is no question here about internal sectional divisions. This is a federation, not an association, so there is no possibility of the central committee being able to dictate internal rules to any of the very autonomous 10 sections. Whatever happens at home, is what the home decides. Once at the state level, then the team gets to choose.